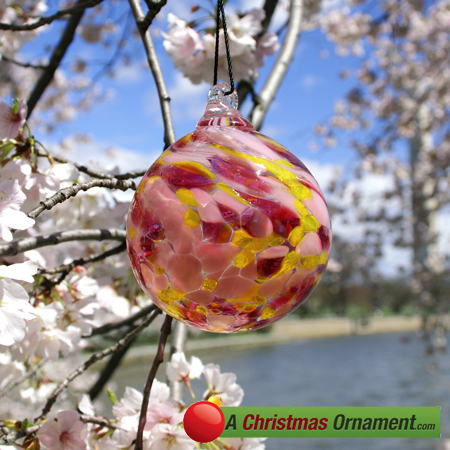 Christmas Ornaments Made in USA - Cherry Blossom Crystal Glass Ornament Ball - A Christmas Ornament Co.
Hand-blown very thick glass; made in America by artisans whose family have been in the glass-blowing art/business for generations. The National Cherry Blossom Festival is held in Washington, D.C. every year to celebrate the 2,700 blossoming cherry trees Japan gave to the United States in 1912 and which are planted along the Tidal Basin across from the Jefferson Memorial. Complete your Christmas tree with something totally unique. Made with pride in the U.S.A. This ornament is simply gorgeous and no two are alike due to its totally Custom nature and measures a whopping four inches in diameter.